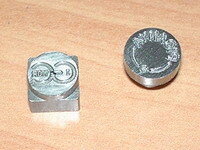 "lead seals customs Seal self-locking seals, seal press, sealing wire and spring for customs seals airlines mail industry security seals"
Identification press to be used with custom lead seals. 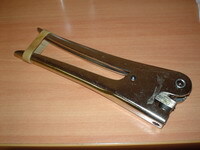 We provided pliers to premention with seals of customized lead or plastic with your logo and the necessary numerations. We as much made long series of engraved pliers like a single one for your precise necessities. We offer the possibility of tempering the dies for those cases of extreme use, guaranteeing a extraordinary durability of the engraving. We have made seals for coffee machines, extinguishers, electricity meter seal, water meter seal, gas meter seal, trailers, trucks, railcars, wagons, airlines, air cargo, bank and value transport, post and courriers, administration and public services, industry, chemical, mechanical, pharmaceutical and raffinery. 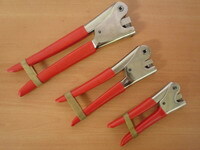 We have a new plier model with isollation grips, very usefull for sealing electricity meters. We are looking for distributors in the UK, get in touch with us if you want to trade with us.